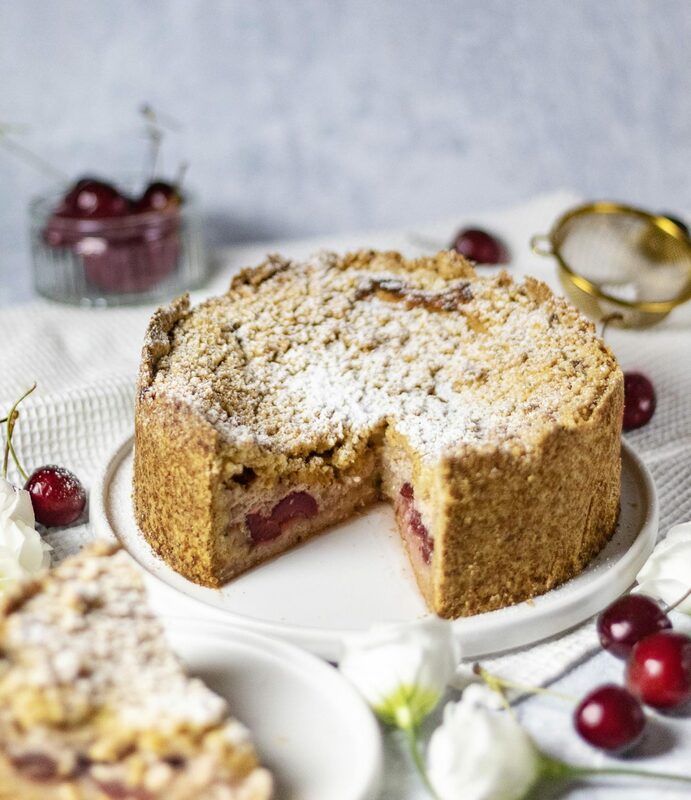 This Vegan Cherry Quark Crumble is an absolute classic! A non vegan version of this delicious cake was in one of my children’s cookbooks when I was younger, and it was only a matter of time until I would create a veganised version – and here we are! 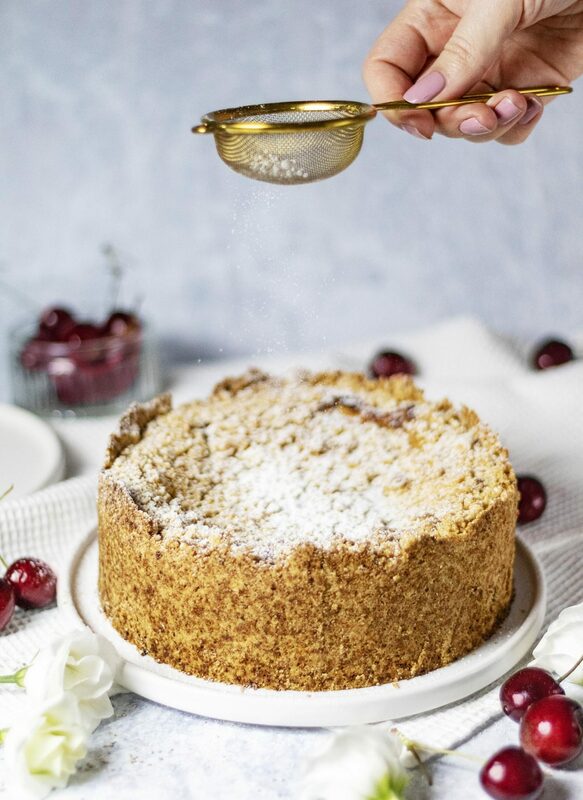 Originally this recipe is called a ‘streusel’, which is the German version of a crumble cake. The crumble is generally created with a mix of flour, sugar and butter, so it’s simple to veganise by swapping out the dairy butter for a vegan version. It’s important that the butter is cold for this recipe to create the right crumble texture – if the butter is melted, the flour and sugar will simply absorb it and create a sticky mix, which is what we’re trying to avoid. For the egg replacement in this vegan cherry quark crumble I have simply used 4 flax eggs. These are created by combining flaxseeds with water in a 1:2 ratio and letting them soak for a few minutes to create a gloopy, thick mix that helps bind everything together in the dough. As the name already calls for, I have used quark in this recipe – quark is not too common in the UK, but in Germany, where I grew up it’s a dairy ingredient you can get in every supermarket. Luckily nowadays Alpro does a vegan version called ‘Alpro Go On’ . If you however do not have access to this Alpro version, do not worry: you can easily create your own quark by stripping some water out of vegan soy yogurt. This is usually what I do to make this recipe: Simply add 1 Tbsp Apple Cider Vinegar to 500g soy yogurt, stir well and place the yogurt in a cheesecloth and suspend over a bowl for about 45-60 minutes, or ideally overnight. The liquid from the yogurt will collect in the bowl below and you’re left with a thicker, denser quark in the cloth, that is perfect for the filling of this recipe. 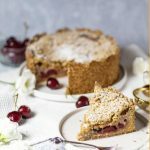 This vegan cherry quark crumble is a classic – I used to make it plenty of times when I was younger for a variety of occasions: birthdays, celebrations, holidays – there’s no occasion this delicious vegan cake is not suitable for! 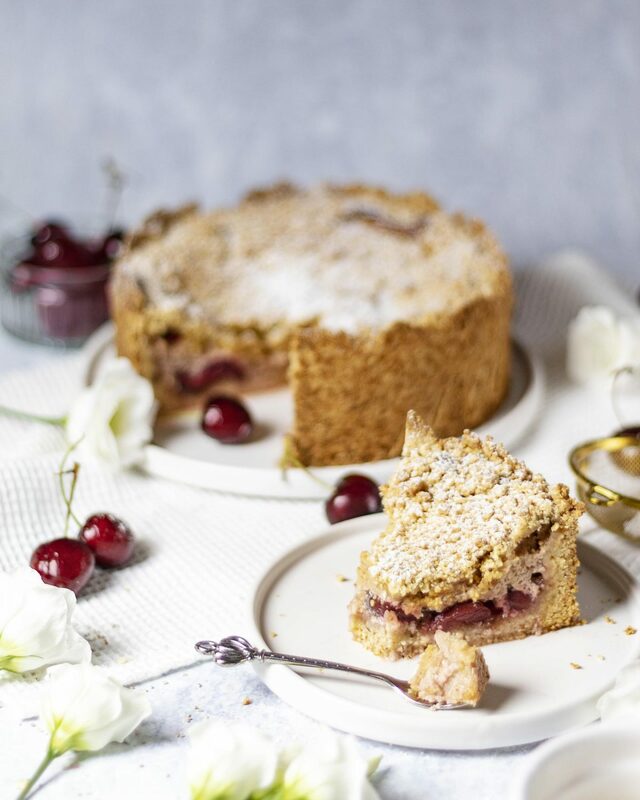 Filled with a delicious creamy quark filling and sweet cherries – and don’t worry if you don’t have access to vegan quark: I’m telling you how to make your own in 2 easy steps below! Combine the Soy Yogurt with the Apple Cider Vinegar, then place the cheesecloth over a deep bowl and carefully pour the yogurt mix into the middle. Tie up the corners of the cloth and suspend it above the bowl so the water can drip out. Place the bowl aside for about 45-60 minutes for the quark to release more water and become firmer. You’re looking to achieve a consistency similar to greek style yogurt. Start by creating the egg replacement by adding 4 Tbsp of flaxseeds and 8 Tbsp of water to a bowl, briefly mix and set aside to soak for 10-15 minutes. In the meantime drain the cherry jar and place the cherries into a sieve to continue draining until we need them again later. In a large mixing bowl, combine the flour, baking powder, vegan butter and half of the sugar. Add in a quarter of the egg replacement and combine. Ideally use your hands as the mix you are going for is supposed to be firm and crumbly. Grease a spring form cake tin with coconut oil – the one I used was 23cm in diameter. Press about 2/3 of the dough onto the bottom and sides and place the rest aside for later. Now create the filling by first combining the leftover egg replacement with the second half of the sugar and the vanilla extract. Add in the vegan quark and the lemon peel and combine until smooth, then slowly drizzle in the semolina and stir well. Add the drained cherries onto the bottom in the spring form cake tin, then gently pour in the quark mixture. Smooth the top with a knife or back of a spoon. Cover the top of the cake by crumbling the rest of the dough on the top. Preheat the oven to 180C and place the cake in the preheated oven for about 50 minutes. Do not replace the quark with just yogurt – it’s important that it’s quark, otherwise the inside of the cake will be too liquid and not firm up during the baking process.